The world of high technology is not unlike a religion. This is especially true here in Silicon Valley where high priests walk the streets, and monuments to their greatness are erected in the form of amazing corporate campuses. However, much like major religious sites around the world, these monuments are mostly off limits to worshipers unless you get invited to lunch by an insider or manage to tag along on their infrequently offered public tours. 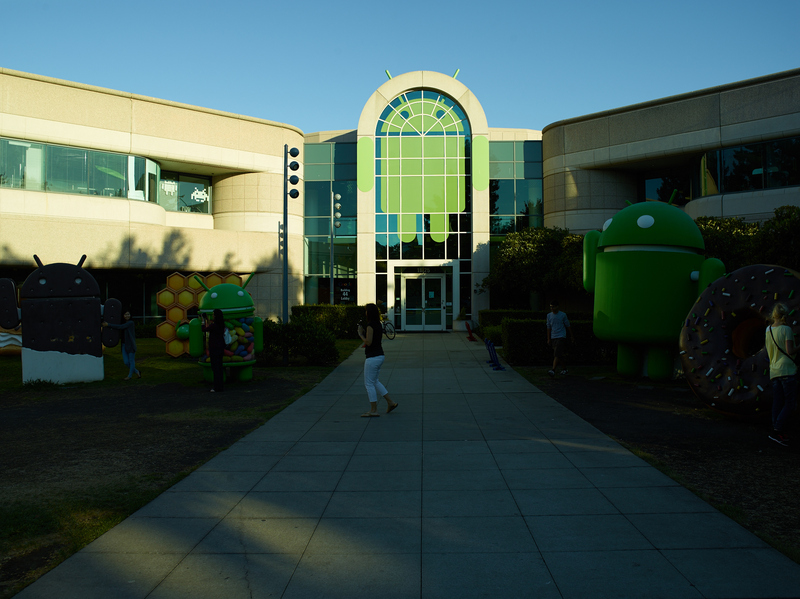 Because I am based in Silicon Valley, my camera often finds itself in front of these monuments (see my Silicon Valley portfolio or In Startup Land). 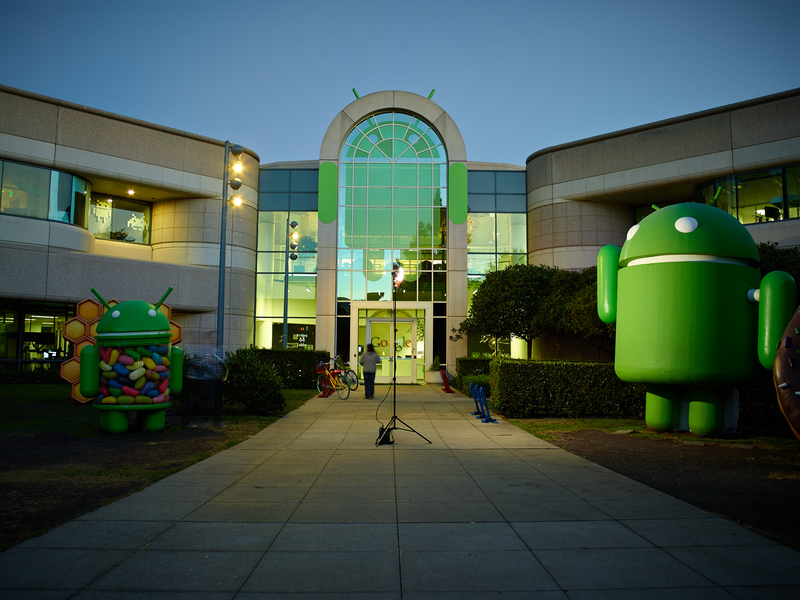 This week it was building 44 on Google’s campus in Mountain View – home to the Android sculpture garden. 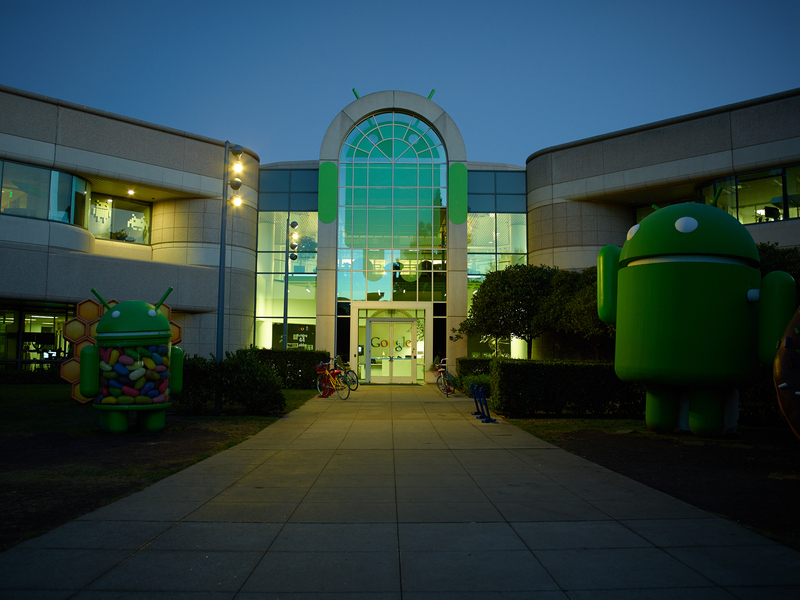 Each time Google begins work on a new version of their Android operating system, they give it a code name. Later, when it’s released, they install a sculpture outside building 44 commemorating it. 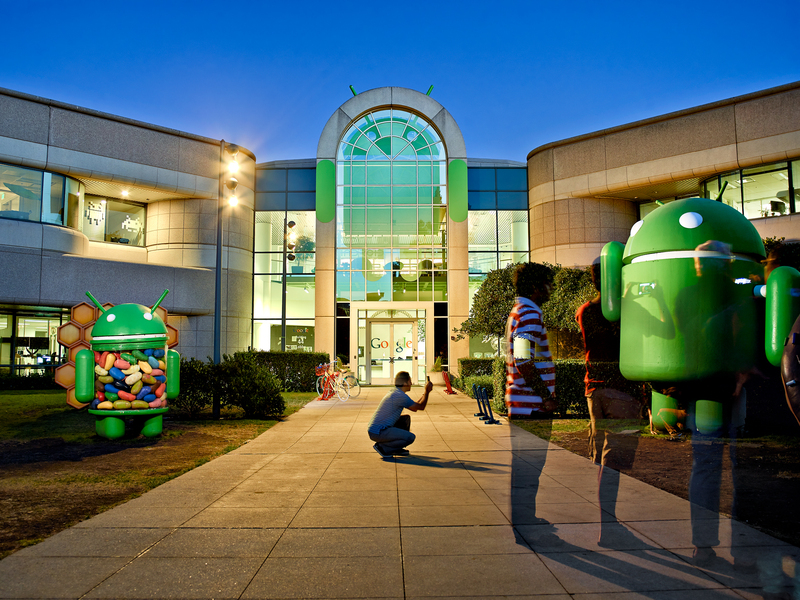 Android release code names have included Kitkat, Honeycomb, Gingerbread, Ice Cream Sandwich, and Jellybean just to name a few. The sculptures have made Building 44 a “must see” for both tourists and die hard fans. Knowing this, I figured that a Sunday evening shoot would be the best time to have the place to myself. When it comes to location shoots, there is usually an inevitable moment when your shoot plan collides with the realities of the location. This happened right as I pulled into the parking lot and saw people all over the place posing for photographs next to the sculptures. It was still early, so I took some scouting shots and started to work out a composition. Above, was the first shot straight out of the camera. I liked the leading lines, but not the mixed shade or the people. The mixed light would take care of itself once the sun set, but then I’d be at the mercy of the building’s lights to make the photo. At this point, I had to wait and see how the light changed during sunset. Here is what the shot looked like 30 minutes after sunset. The building lights created some nice background contrast with the fading blue sky, but the sculptures were in shadow. Increasing the exposure would bring back the sculptures, but it would over expose the lights in the building. With my ambient exposure locked in and fading fast, I had to add light back into the scene using flash. However, there were still plenty of people posing for photos in front of the sculptures. As much as I wanted to set up light stands around the place, it would ruin their view. Instead, I opted to light each sculpture separately using individual exposures and then combine all the shots in Photoshop. All I had to do was take a shot, reposition the light, take another shot. I repositioned the flash four or five times to light everything the way you see in the opening photo. The flash here is an Elinchom Quadra RX with a bare head on a light stand. It’s synced to the camera using a Skyport radio trigger. Radio triggers were key here because the flash lost line of sight with the camera when I put it behind that left hedge to light the bicycles. If I’d only had an optical trigger, I would’ve been up the proverbial creek. A variety of techniques are needed to pull this off. First, you must keep the camera perfectly still between shots. This means locking the camera down on a sturdy tripod, switching to manual focus, and using a cable release to trip the shutter. Next, you need to bring all the exposures into Photoshop and blend them in a way that layers just the portion of each image lit by the flash on top of your base exposure. Knowing you’re going to blend in Photoshop also means controlling light spill from the flash so you don’t inadvertently light part of the image you want to remain dark. Yes, you could mask the spill in photoshop, but why make it more difficult for yourself than you already have? Funny enough, after getting frustrated with all the people ducking in and out of my shots, I decided to keep a few in the final image because they helped to tell the story.